There is a gift in pain. When we think of gifts, we think of wonderful surprises that bring us joy and happiness. There is the wide-eyed delight on a child’s face as they open the biggest present under the Christmas tree. We think of the love on a parent’s face as they hold their newborn for the first time. There is the look of joy on the faces of two people as they pledge themselves to each other for life. When we were children, we thought that everything would be great ‘when we grow up’. We could get to be whatever we wanted to be…when I grow up I’m going to be a pilot/ a model/ a nurse, a fireman. Children believe that, as adults, they will be able to make all the decisions, and do whatever they want to do. That no-one would tell them what to do. And that life would be wonderful. But then, children grow up and discover that it aint so! We found out that life could deal us blows that we never dreamed of. People discover that life can rob them of the things most precious to them. We realise that even with our best efforts, life does not necessarily turn out the way we planned, or the way we’d like it to. Sadly, for some people, that realisation comes early, in childhood, at the hands of people they trusted. And nobody, nobody, ever told us that life would bring pain. Whether it’s physical pain, mental pain or emotional pain, the dominant message we receive via culture and advertising is to anesthetise. Pain is seen as a barrier in life, a barrier to living the wonderful ‘when I grow up’ fantasy life that we continue to believe is reality. Pain is seen as a negative, as something intrinsically bad or wrong, something that gets in the way of living the fulfilled wonderful life of our childhood dreams. But what if we choose to see pain as a normal part of life? Because it is! Pain comes to us all. What if we accepted that as a reality and then when pain comes, when the difficulties of life arise, we are much less surprised and much more able to see the pain for what it is – a normal part of life and a bringer of unique gifts. Could pain be a gift? We usually don’t see the pain, that accompanies difficult life events, as a gift because we are addicted to life being wonderful. We don’t see abuse, or miscarriage, or death, or divorce or poverty, as gifts. And in themselves they are not things that we attract or welcome into our lives. They are painful parts of the human experience. Common parts of the human experience. But could they be gifts to us? Could the difficult, terrible, awful things that happen to every human being also be gifts? Could there be a gift in the pain we experience? My answer is, of course, yes! What is the gift in pain? They have found the gift that pain brings. They have discovered the resilience, strength, compassion, self-awareness, character, values, love, courage…any one of numerous qualities that are both birthed and developed in the difficulties of life. They have found the gift in the pain. I want to be clear. Finding the gift in the pain is not another form of anesthetising yourself to the pain. I am in no way discounting the depth or intensity of pain that people feel in life’s difficulties, nor am I approving of the pain that human beings willingly inflict on each other. The pain is real, and it often lasts for years. But, if we could accept that pain is a part of life – necessary for our development as human beings – when pain comes to us perhaps we could view it differently. When pain comes, as it inevitably does – more than once in any lifetime – we could allow ourselves to really feel it. We could allow ourselves to sit with the grief that accompanies loss. We could allow ourselves to be angry and frustrated with how things have changed. We could honour all that we feel in the face of life’s hard times. And by doing this, we allow ourselves – and others – to be fully human. Flawed hurting human beings. People who love and lose. We accept pain and difficulty as normal. We even embrace the difficult times knowing that in them we discover something very precious. We discover a depth to ourselves that we never knew existed. We discover that we are more flawed than we like to think – and that’s okay. We discover that we really are wonderful in our brokenness in a way we ever dreamed possible. We discover that there is a gift in the pain. Has this been your experience? Do you know how to find the gift in the pain that you’ve experienced? 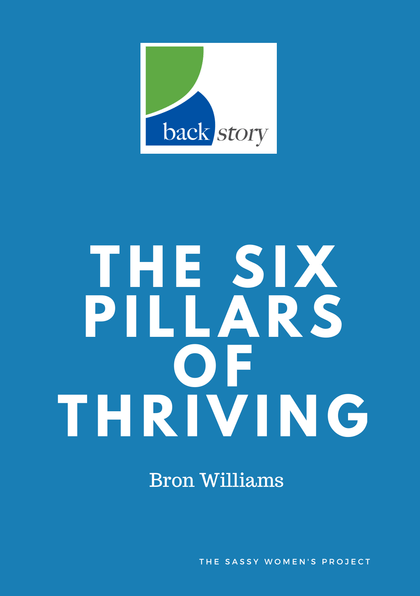 My Six Pillars of Thriving is one way to start looking at what you can do with the pain of your life. If you’d like a free PDF copy, just fill in your details below and it’ll wing its way to your inbox.